Volcanoes, and hence geothermal resources, are also associated with mythical power and beliefs. The development of these geothermal resources requires much consultation and negotiation with the natives inhabited in the areas. The final develop­ment of these resources normally includes some forms of partnership and reparation for the natives. Examples include Mount Apo in The Philippines and Ohaaki in New Zealand. The development of a geothermal power project will have environmental impacts on the physical surroundings as well as on the socioeconomics and health of the surrounding communities. The physical environment includes the land, water, air, flora, and fauna. Most countries have strict environmental legislation such as the National Environmental Policy Act (NEPA) in the United States and the Resource Management Act (RMA) in New Zealand. The most important requirement of the environ­mental laws is the environmental impact report (EIR). This report is also called the environmental assessment (EA), environmental impact assessment (EIA), environmental impact statement (EIS), and assessment of environmental effects (AEE). The acts mandate processes that must be followed for the assessment and suggestions for any preventive and mitigating measures. Any disagreement may be redressed in an environment court. The EIR normally follows a checklist of environmental impacts. The positive result of an EIR is an environmental permit or consent, approved and issued based on the technical, environmental, and social acceptability of the proposed project. Every geothermal resource is unique; hence, the actual physical environmental impacts of a geother­mal power project development and its subsequent operation vary from one project to another. Some examples of the common physical environmental impacts are described next. The land may be unstable, so any development may trigger landslide or soil erosion that could be made worse in areas of heavy rainfall. This is particularly true for many geothermal systems in difficult terrain associated with volcanic environ­ments. Examples of geothermal systems with difficult terrain include The Geysers in the United States and Leyte in The Philippines. The actual land area required for a geothermal power plant is relatively small compared with that needed for other types of power plants when the areas of the resources are taken into account. A 100-MWe geothermal power plant requires approximately 1 km2 of land; a coal – fired power plant requires approximately 4 km2, including the coal mining area; a hydropower station requires roughly 10 to 30 km2; and a wind power station requires approximately 40 to 70 km2. The land uses that are unique to a geothermal power plant are the pipeline corridors and geothermal well pads. Some geothermal areas are used for farming (e. g., Mokai and Rotokawa in New Zealand), but geothermal power plants and steamfields can coexist very well with other land uses such as farming and agriculture. Indeed, some development of geothermal systems provides aquaculture (e. g., prawn farm in Wairakei) and recreation (e. g., swimming pool at Svartsengi, Iceland). Land subsidence is a common occurrence in geothermal development. Wairakei, after more than 40 years of operation, has a general subsidence of 10 to 30 mm/year over the whole steamfield. The maximum subsidence is approximately 250mm/year, creating a small lake 18 m deep. Fortunately, the area of maximum subsidence is confined to a small area at the perimeter of the steamfield, causing minimal effects. Subsidence has also occurred at the Ohaaki after more than 20 years. It is difficult to predict land subsidence before the development of a geothermal steamfield. So, a monitoring program of the ground levels is required from the start of the development to ensure the safe operation of the steamfield as well as for environmental reasons. In general, the with­drawal of liquid from wet fields appears to cause greater subsidence than does withdrawal of steam only from dry fields. The fluid production from a steamfield may also cause the surface manifestations to change, causing hydrothermal eruptions and creating new mud pools, fumaroles, and ground steam discharges. The changes to the ‘‘Craters of the Moon’’ near Wairakei are believed to be the result of fluid production at Wairakei. The withdrawal of geothermal fluids may also cause local micro earthquakes. Gaseous discharge from the operation of a geothermal power plant is relatively small compared with that from the operation of a fossil fuel-fired power station. In general, the combustion of fossil fuels to generate electricity produces 3 to 20 times more carbon dioxide (kg/kWh) than that produced by a geothermal power plant. Although geothermal steam normally contains a small quantity of hydro­gen sulfide that is not present in fossil fuels, the combustion of fossil fuels produces much more sulfur dioxide and nitrogen oxides that are not present in geothermal steam. Water is required for the well drilling and construction phases. A circulating water system is required for the power plant during operation. Wet geothermal fields produce much separated geothermal water that requires disposal. The takings and discharges of water during the development, construction, and operation stages all must be assessed for environmental impacts to the sources and sinks of water. All of these require water rights that are reviewed and monitored at regular periods. Because the amount of land required for a geothermal power plant is relatively small, the effects on flora and fauna are also relatively small. However, being unique in nature, geothermal areas may also contain unique forms of flora and fauna. These flora (mostly fungi) and fauna (small organisms) may survive only in the warm areas of the geothermal activities. Their ecosystems might need to be protected and maintained. Noise pollution of a geothermal power project will occur during the well drilling, construction, and operation phases. Because many geothermal areas are in remote areas where the background noise is very low (~ 40 dBA), any additional noise from geothermal activities will be heard by the local residents immediately. Impacts of noise on animals are reported to affect their behavior, physical size, and reproductive activities. Well drilling produces noise of 80 to 110 dBA, and a well discharging without a silencer produces 120 to 125 dBA of noise, which is at the threshold of pain for the human ear. The noise of a well discharging into a silencer is reduced to approximately 90 dBA. Visual effects from a geothermal development include the tall drilling rig during drilling phases and the tall (~100-m) natural draft cooling tower if adopted. Wet mechanical draft cooling towers are much lower, but their plumes are much more visible. The plumes can be minimized with a wet and dry cooling tower. Visual impact of geothermal pipelines has been minimized by painting them the color of the background. A fundamental purpose of a socioeconomic impact study of a geothermal development is to identify the three key sectors that are affected by the project: investor, beneficiary, and victim. The final outcome of the project must have the equity of benefit and compensation to all affected sectors. The main aim of a socioeconomic study is to determine the changes in conditions within, adjacent to, and in proximity to the project area as well as the direct and indirect impacts of these changes. This requires past and current baseline data, usually going back 10 years. These data are gathered from records, surveys, and consultations with the local communities and other interest groups. Social acceptability of projects are normally obtained if no extreme changes result and the affected communities can adjust their lifestyles to the new benefits that are gained. These benefits may include employment, lower electricity prices, and funding for local charities. The most difficult problem that a geothermal power plant faces is the reliability of the steam supply. Well characteristics can and do change with time after a period of production. Many geothermal power stations (e. g., Wairakei, The Geysers) have never been loaded to their full capacities due to the shortfall of well output. The initial logical solution to this problem was to drill more wells, but this practice tends to worsen the problem with rapid drawdown. This problem is due to the overestimation of the reservoir power potential. The solution to this problem is staged development. The expected draw­down was incorporated during the design stage at Ohaaki, but the drawdown was faster than predicted. A major operational problem that a geothermal power plant faces is the solid deposition of silica or calcite in wells and equipment exposed to the geothermal fluids. Although the chemistry of the deposition can be predicted with reasonable accuracy, the solution to the deposition problem is not always clear-cut. The common solution is to inject a chemical inhibitor into the problem wells. Suitable calcite inhibitors include polyacrylate, polymaleic acid, and phosphonate, depending on the application tempera­ture. Many acids or alkali are suitable silica inhibitors. The inhibitor is injected just below the fluid flashing point where the solid precipitates out of the liquid phase during flashing (Fig. 14). The inhibitor injection is very effective if applied correctly, although it does not actually stop deposi­tion altogether. Physical removal of the solid deposits is still required once every few years instead of a few times each year without inhibitor. Not only is there a loss of production due to well shutdown to remove the deposits, but the cleaning may require a drilling rig or expensive acids. Another hazard associated with a geothermal power plant is earthquake and/or volcanic eruption. power producers (IPPs). There is a perception that the private sector is more efficient than the public sector. The efficiency arises from the increased flexibility of the private sector and its accessibility to commercial funding. There are several types of contracts in the commercial development of geothermal power pro­jects. In a BOT (build, operate, and transfer) contract, a private developer builds the whole power station (including the steamfield), operates the power station for an agreed period of time to recoup its investment, and then transfers the power station back to the host country. 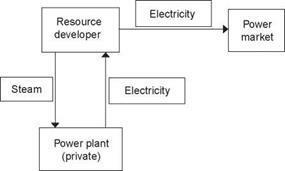 In a BOO (build, own, and operate) contract, the developer builds and operates the power station as its own business. In a BOOT (build, own, operate, and transfer) contract, the developer transfers the power station back to the host country after an agreed period. Developing a geothermal resource carries higher commercial risks than does building and operating a power plant. From a private developer’s viewpoint, it is more favorable to just have an energy conversion agreement (ECA) contract in which the private developer builds and operates a power plant, converting the geothermal steam supplied by the host country and producing electricity for the host country (Fig. 15). The host country develops the geothermal resource. An ECA contract will involve a steam sales agreement (SSA) and a power purchase agreement (PPA). In a more traditional EPC (en­gineer, procure, and construct) contract, an engineer­ing consulting company designs and builds the power plant and/or steamfield for a fee. When private developers first entered the com­mercial development of geothermal power projects, they developed the resources, operated the steam- fields, and sold steam to power companies operated by government agencies. The classic IPP operation is for the private sector to develop both the geothermal resource and the power plant and to sell electricity to the host utility that deals with the electricity market. The latest trend is the ECA operation. FIGURE 15 ECA project structure. geothermal resource must be manageable. Therefore, the selection of the exploitation process, power cycle, and power plant is critical to minimize capital cost and maximize power output. Risks are inherent in the resource and power plant development. Resource exploration risk is relatively high, with a corresponding higher return potentially at moderate investment. This type of risk is familiar to the mining and oil exploration companies. The steamfield and power plant development risk is low. Most IPPs and bankers are familiar with this risk. Risks are best managed by those who are best at controlling them. A developer is best responsible for the project implementation, and contractors are best at managing risks within their own areas of work. Some risks, such as resource and steamfield process risks, must remain with the owner. Risk allocation has driven the move toward EPC contracts. There is an apparent conflict between the financial goal of maximizing return with a rapid development program and the risk mitigation strategy to minimize risk with a slow program. The solution to this apparent dilemma is to adopt a staged development. The production drilling stage is a major expendi­ture phase, with each well costing U. S. $750,000 to $3 million. Well outputs are highly variable, from a dry well to one that may produce 40MWe. Once production drilling starts, the aim is to produce electricity, and hence return on investment, as soon as possible. Cost controls are paramount during the production drilling stage. A decision is required for the generating capacity of the power plant. For a staged development, the capacity of the first stage can be 25 % of the estimated power potential. Because there are economies of scale in turbo-generator unit size, the tendency is to go for the largest single unit of approximately 55 MWe if possible. However, this requires optimization against operational flexibility and power demand. In general, the power plant costs approximately 50 to 55% of the total cost of a geothermal power project, the production drilling costs 25%, and the steamfield costs 15%, with the remaining 5 to 10% of costs due mainly to exploration drilling. Currently, a geother­mal power project costs between U. S. $1000 and $2000/kWe, depending on the quality of the steam. An electricity unit cost of U. S. 5 to 8 cents/kWh is achievable. This is very competitive compared with conventional thermal and hydropower stations. I thank the following people for their support and assistance: D. H. Freeston, P. R. L. Browne, C. Morris, L. Bacon, K. L. Brown, and C. Z. Lee. I acknowledge the following permissions: M. Dickson and M. Fanelli for Table I, International Geothermal Association for environmental course materials convened by K. L. Brown (Geothermics) for Fig. 1, Geothermal Energy Association for Table II, H. Hole for drilling lecture notes, J. B. Randle for commercial development lecture notes, K. Koorey for Fig. 13, and K. C. Foong for steamfield lecture notes. I also thank the Geothermal Institute for office space. Armstead, H. C. H. (1983). ‘‘Geothermal Energy: Its Past, Present, and Future Contributions to the Energy Needs of Man,’’ 2nd ed. E & FN Spon, London. Clark, I. F., and Cook, B. J. (Eds.). (1992). ‘‘Geological Science: Perspectives of the Earth.’’ Australian Academy of Science, Canberra. Dickson, M. H., and Fanelli, M. (Eds.). (1990). ‘‘Small Geother­mal Resources: A Guide to Development and Utilization.’’ UNITAR/UNDP Center on Small Energy Resources, Rome. Goff, F., and Janik, C. J. (2000). Geothermal systems. In ‘‘Encyclopedia of Volcanoes’’ (H. Sigurdsson, Ed.). Academic Press, San Diego. Grant, M. A., Donaldson, I. G., and Bixley, P. F. (1982). ‘‘Geo­thermal Reservoir Engineering.’’ Academic Press, New York. Hochstein, M. P., and Browne, P. R. L. (2000). Surface manifestations of geothermal systems with volcanic heat sources. In ‘‘Encyclopedia of Volcanoes’’ (H. Sigurdsson, Ed.). Academic Press, San Diego. James, R. (1970). Factors controlling borehole performance. In ‘‘Proceedings of UN Symposium on Development and Utilisa­tion of Geothermal Resources’’ (Vol. 2, pt. 2, pp. 1501-1515). United Nations, Pisa, Italy. Kestin, J. (Ed.). (1980). ‘‘Sourcebook on the Production of Electricity from Geothermal Energy.’’ Brown University Press, Providence, RI. Lee, K. C. (1997). Geothermal power technologies for different types of geothermal resources. In ‘‘New Energy Technology for Asia Pacific’’ (World Energy Council Asia Pacific Regional Forum, Vol. 2, pp. 189-203). WEC China National Committee, Beijing. Lee, K. C. (2001). Classification of geothermal resources by exergy. Geothermics 30, 431^42. Morris, C. (2003). ‘‘Operation and Maintenance Experiences of Wairakei Geothermal Power Station’’ (preprint). Contact Energy Ltd., New Zealand. Smith, I., Stosic, N., and Aldis, C. (1995). Trilateral flash cycle system: A high efficiency power plant for liquid resources. In ‘‘Proceedings of the World Geothermal Congress’’ (Vol. 3, pp. 2109-2114). WGC, Florence, Italy. The cost of mercury removal in IGCC plants is lower because the treated volume of syngas is much smaller than that of the flue gas in PC-fired plants. • IGCC lends itself to more efficient removal of CO2 from high-pressure fuel gas. Measurements of EMF flux densities to which an individual is actually exposed, as obtained by a personal dosimeter? • Measurements of EMF flux densities present at a relevant location in the home or work site? • Measurements of EMF flux densities made at a constant point outside of the home (‘‘front door’’ measurements)? Transformity is one example of a unit emergy value and is defined as the emergy per unit of available energy (exergy). For example, if 4000 solar emjoules are required to generate a joule of wood, then the solar transformity of that wood is 4000 solar emjoules per joule (abbreviated sej/J). Solar energy is the largest but most dispersed energy input to the earth. The solar transformity of the sunlight absorbed by the earth is 1.0 by definition. Distribution losses downstream of end-use devices (an efficient furnace feeding leaky ducts yields costlier delivered comfort). • Undesired or useless services, such as leaving equipment on all the time (as many factories do) even when it serves no useful purpose. • Misused services, such as space-conditioning rooms that are open to the outdoors. The initial kinetic and potential exergies of S are entirely ‘‘recovered’’ into useful work; in fact, they might be included in the enthalpic term by considering a baroclinic total enthalpy, htot = h + 0.5 V2 + gz. Work exchanges between S and E are entirely recovered in the exergy balance. This derives from the fact that work is exergy and, as a consequence, the kinetic and potential energy contents are entirely equivalent to exergy. If we define a quality or exergetic factor as the ratio between the energy and the exergy content of an energy flux, and since electrical energy is equivalent to work, all these high – quality forms are seen to have an exergetic factor equal to 1. Thermal energy has an exergetic factor equal to its associated Carnot efficiency: This reflects the fact that, under the given assumptions, the maximum work that can be extracted from a quantity of heat Q available at a certain temperature T is equal to Wq = (1—Te/T) Q. If S is initially at a lower temperature than E, thermal energy will flow from E to S, with a corresponding exergy flow equal to Eq = (1—T/Te) Q. This amount is always positive. and 36%, respectively. The small difference in the efficiencies is due to the fact that the specific chemical exergy of coal is slightly greater than its energy. Although the energy and exergy efficiencies for the station are similar, these efficiencies differ markedly for many station sections. In the steam generation section, exergy consump­tions are substantial, accounting for 659 MW (72%) of the 916 MW total exergy losses for the station. Of the 659 MW of exergy consumed in this section, 444 MW is due to combustion and 215 MW to heat transfer. The energy and exergy efficiencies for the steam generation section, considering the increase in energy or exergy of the water as the product, are 95 and 49%, respectively. The steam generation section thus appears significantly more efficient on an energy basis than on an exergy basis. Physically, this discrepancy implies that although 95% of the input energy is transferred to the preheated water, the energy is degraded as it is transferred. Exergy analysis highlights this degradation. flywheel Rotating object, such as a wheel, often used for opposing and moderating by its inertia any fluctuation in speed in the machinery with which it revolves; also capable of storing mechanical energy. high-temperature superconductor (HTS) A superconduc­tor with a critical temperature above the boiling point of nitrogen. motor/generator (M/G) Combined motor and generator used to convert between the mechanical energy of the flywheel and electrical energy. rotational kinetic energy Energy in the form of rotational motion given by the quantity KE — 1/2 Irn2, where KE is the kinetic energy (units of joules), I is the moment of inertia (units of kgm2, and o is the rotational speed (units of rad/s). specific energy Energy stored divided by mass of object (units of m2/s2). Polymer electrolyte membrane (PEM) cells use a plastic (polymer) membrane that becomes electrically conducting when hydrated (saturated with water); they operate near 100°C. much attention has been paid to the increase expected from Asian markets that analysts often forget to note the continued importance of the U. S. market to OPEC. U. S. net oil imports rose from 6.79 million barrels/day in 1991 to 10.2 million barrels/ day in 2000, while global oil trade (i. e., oil that was exported across borders from one country to another) rose from 32.34 million to 42.67 million barrels/day. The U. S. share of the increase in global oil trade over the period was a substantial 33%. In OPEC terms, the U. S. import market was even more significant—more than 50% of OPEC’s output gains between 1991 and 2000 (Table III). FIGURE 10 A typical geothermal well output characteristics.